Sad Day! Around the world. 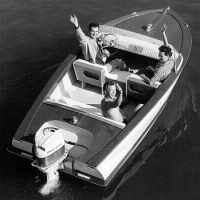 I hope you find comfort in that your dad provided an avenue that lead to incredible amounts of enjoyment for all the families that have been able to enjoy boating in one of your fathers fantastic designs. He brought a great feeling of accomplishment to of all those who have built them. Because of your dedication in keeping the company going and continually updating and growing people around the world will continue to be brought joy from your families work for many years to come. Although most of us never met him I feel its safe to say he lived a full and honorable life. I am glad you were able to have him around for so long. Very sad news!!! We will all miss him dearly. But He lives on in our boats and our hearts. I want to second what other's have said and add that of all the people on this planet, so few get the opportunity to make such a difference in the lives of others. I think it is safe to say that your father was one of those individuals. Through his designs, the company that he founded, the devotion he engendered from all those he worked with and dealt with, his family, and all those that he inspired to or made possible to create their own version of his original dream; he created a lasting legacy. A bit of your father lives on in every one of his boat designs made or even those not finished. I for one am glad to have had the opportunity to participate in one of the most satisfying hobbies I have ever enjoyed and I have your father to thank for that. Rest in peace Glen. I think all of the Gatherings were somewhat of a Memorial to him, his knowledge,and all that he shared with us. We should make G11 special in this regard. Whenever I tell someone, " I built it myself" I feel slightly guilty because I was only assembling the designers plan. I have found many life lessons in his plans. If I'd had the chance, I would simply have said, "Thank you..., for what was and continues to be, the most rewarding experience of my life thus far". Sad day.Wish I had known him.He reminds me of my dad who also passed recently(Last Memorial day weekend) who also did work with boats(built a fishing camp in1963 and which is still going strong)he was 88 years old . Dear Gayle, My heart goes out to you and yours for your loss. I have and will continue to think about him and his work as I build my boat. Gayle; Your father and I built five boats together so far, and I hope he enjoyed my company as much as I did his. He changed my life for the better. I hope you take comfort and pride in knowing that Glen encouraged people around the world to build rather than tear down and strive for excellence. I'm certainly also thinking of John, Anka, and Barry, and the others at Glen-L. You've been a part of my life for a long time. I only spoke to your dad once but he gave me good advice. His memories will live on all over the world.